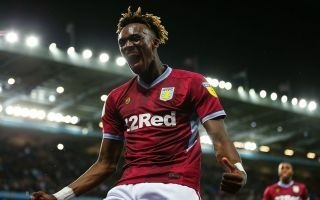 Chelsea forward Tammy Abraham scored a sensational 25 minute hat-trick for loan club Aston Villa in the first half of their insane goal fest against Nottingham Forest. Villa found themselves 2-0 down after only six minutes of action but Abraham scored a delightful double in three minutes to get the Villains back on level terms. Abraham’s first goal was a towering header resulting from an inch-perfect cross from teammate Yannick Bolasie. Abraham’s second was bizarre to say the least, the England Under- 21s star managed to deflect a goal-line clearance from Nottingham Forest into the back of the net. The scores didn’t remain even for too long though with Forest once again taking the lead in the 22nd minute of the tie. Abraham completed his hat-trick and in turn Villa’s first-half comeback in the 36th minute of the tie with a cool, calm and composed penalty. Abraham is a fan favourite at Villa Park and his hat-trick this evening was the first senior hat-trick of his career. Abraham’s ability to sniff out a goal could be invaluable to Chelsea in the future. Maurizio Sarri should consider recalling Abraham in January to bolster the Blues frontline.